Good news, we have just released vScope 3.3! Even better news is that we in this version introduce support for inventory of backup solutions. Our first version of vScope Backup allows any organization using Veeam to ensure that data is properly secured. Backing up data might be one of the most important tasks for an IT organization to ensure that valuable information and hours of work is not lost upon a system failure. 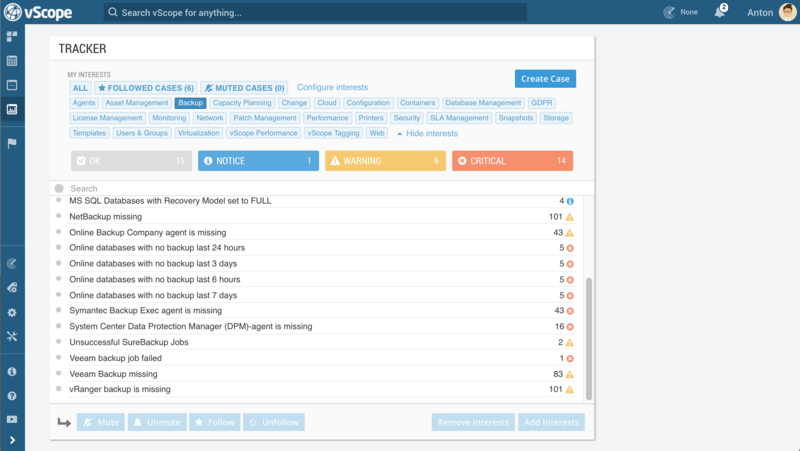 While setting up custom alerts in your backup management system is a good way to stay informed about backup run status, it is not enough to give you the full picture of whether or not your backup is setup properly. Many backup management systems are also lacking a good user interface to allow organizations get a good overview of backup configurations, duration or settings that might affect the extent of backup compliance. The solution is often scripting and manually crafted Excel sheets which not only takes a lot of time but also requires prerequisites within backup (and scripting!) to get the needed information. With vScope 3.3 you will be able to inventory your Veeam Backup system and aggregate all relevant information in one single view. Not only does this help you investigate how all of your backup jobs are configured but also to correlate backup information with information about VMs, databases and storage. This allows you to trace information and understand what data is backed up, where it is located and when it was backed up. Very convenient and intuitive. The neat thing with vScope is that once you’ve learned the basics you will be able to view information about any resource. To get started you will need to add inventorying of Veeam backup in your Discovery Manager. Here is a quick guide of how that is done. Once you have finished your Discovery you will be able to view the backup information in vScope. Why not try to search for Veeam in the Omnisearch field? Here you will find shortcuts to machines, jobs, analysis and bundled reports about all Veeam backup jobs that was found by vScope. Let’s click one of the jobs in the list. In this properties view you can see all relevant information about your Veeam jobs. Notice that there are different pages for different types of jobs eg. Sure jobs, Configuration jobs or just plain Veeam jobs. It is really easy to jump to related machines if necessary, making use of vScope’s unique correlation features. The neat thing in vScope is that you easily can extend this information (about backup) with information about other resources. Like in this case where we can find out what File shares that are backed up with the listed jobs. Very important feature when needing to demonstrate where protected data is stored (read GDPR). And finally, of course vScope has bundled analysis related to backup compliance and best practice. Under the interest tab in Tracker you will find out more about your backups. We are happy to announce this functionality in vScope since it will provide our customers with completely new values. 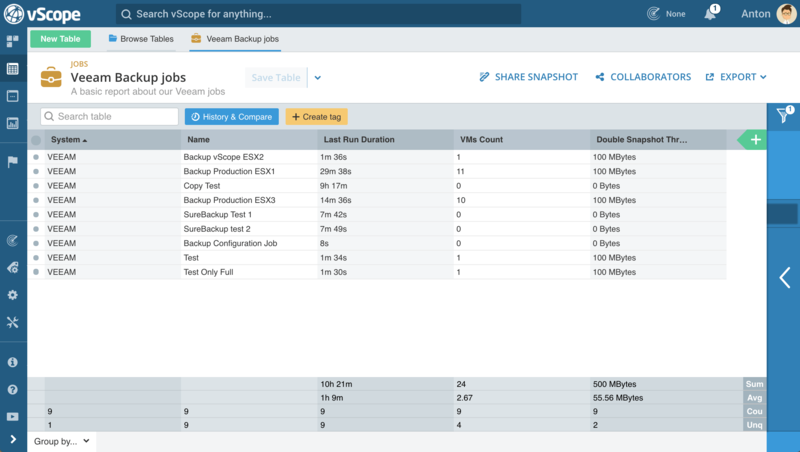 We offer vScope Backup as a trial so you can evaluate the product in your environment. If you want to know more about vScope Backup I suggest you to read more on the product page or contact us to learn more about what vScope can do for your organization. Want to know how vScope Backup can help you?